Two Young Women with Shining Bread | Ich bin ein Sender. Ich strahle aus! | I am a sender. I transmit! Cardboard, paper, chocolate painted over in oil paint (Browncross). 72 x 20 x 1.5 cm. 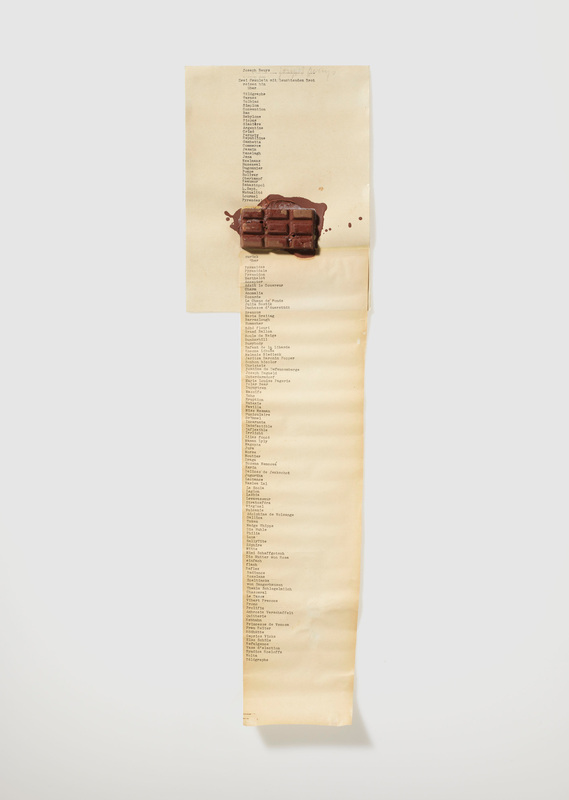 Two Young Women with Shining Bread consists of two typewritten lists of words, separated by a piece of painted chocolate. The first list commences with the phrase ‘Two young women with shining bread embark on a journey via…’ [Zwei Fräulein mit leuchtendem Brot reisen hin über…]. This opening declaration is followed by a list of thirty destinations, beginning with ‘Télégraphe’ and ending with ‘Pyrenées.’ Beneath the chocolate, the second list begins with the words ‘back via’ [zurück über], apparently announcing a return voyage of some kind. Aside from being spelled in French, the terms in the first list seem wholly unrelated to each other. They derive, however, from a common source: a map of the Paris Metro, whose station names they replicate. The entries in the second list share no such common origin and appear to be entirely random. Ranging freely across time, space and subject-matter they succeed one another with no apparent logic. Perhaps the sole indication that they do indeed describe a voyage is provided by the list’s final entry, ‘Télégraphe,’ which is the first Metro station to appear on the journey’s outward leg. But what kind of circular journey is this and why does it contain two stages, separated by—of all things—a piece of painted chocolate? 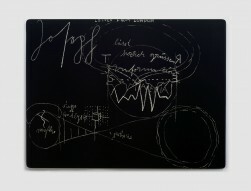 In a 1970 interview with Jörg Schellmann and Bernd Klüser, Beuys responded to these queries. The first part of the protagonists’ journey, he suggested, transpires ‘underground,’ ‘by way of going into the interior of matter as it were… .’ The second leg, by contrast, takes place in ‘the open air.’ Many of the words which describe this second voyage are names, he added, specifically human names: ‘By this is meant that the journey is then through… human souls.’ And not just ordinary souls, since the names he selected have an air of exclusivity and ‘sound like names of nobility.’ They therefore carry with them connotations of elevation and exaltedness.1 It would seem, then, that the two stages of the journey take place in two distinct domains, the first being the mundane realm of matter and the second the elevated realm of spirit. 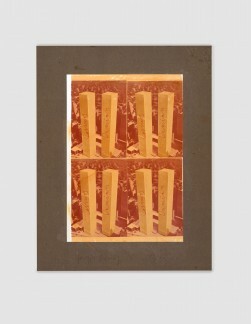 With these observations, Beuys connected Two Young Women with Shining Bread to his core aspiration as an artist: to use creativity to foster human spiritual development—a process of transcendence that the work’s two young women undergo. Commencing underground within the depths of matter, they begin a step-by-step ascent into the open air, in time arriving at the summit of the Pyrenées. Beyond the mountains lies the sky, whose intangibility marks the onset of the spiritual realm. Traversing this threshold, which is marked by the shining bread, they leave the zone of matter behind. Having reached these airy heights, however, they then descend once more into to the physical arena, which they henceforth inhabit in a more spiritually-connected manner.